A physician can make a positive impact on every patient, but an engineer who develops the right biomedical device could potentially help millions of people suffering from an illness or injury. 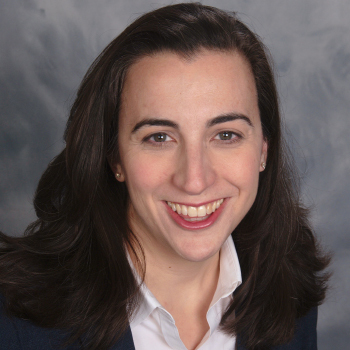 Alumna Stephanie Kladakis, S.B. ’96, is that engineer. The chance to make an impact on many lives inspired her to pursue biomedical engineering at the Harvard John A. Paulson School of Engineering and Applied Sciences, rather than follow a path into the medical profession. Today, Kladakis is vice president of research and development at Carmell Therapeutics, a 10-year-old regenerative medicine company headquartered in Pittsburgh. She is leading the development of its first product, a bioactive “putty” designed to accelerate healing of broken tibia bones. The putty uses human blood platelets to promote healing for severe bone fractures which affect nearly half a million U.S. patients annually, according to the National Center for Health Statistics. Bleeding is a critical part of the body’s normal healing response, Kladakis said. Platelets in the blood stick to the wound site, burst, and then release growth factors that tell the body to recruit cells to promote healing of the injury. Carmell’s novel bioactive putty contains a concentration of growth factors from donor blood that can be spread directly onto the broken part of the bone. The company recently wrapped up a successful overseas clinical trial, which tested their bioactive product’s ability to accelerate healing of open tibia bone fractures. Kladakis is also managing preclinical development of similar bioactive products for enhancement of tissue healing. She manages all aspects of each product’s development, from concept to final design. Since Carmell Therapeutics is a startup company with a small staff, Kladakis’s responsibilities extend beyond development to manufacturing. For an engineer who began her career at Johnson and Johnson, working at a startup offers unique challenges and tremendous learning opportunities. The engineering and development expertise that Kladakis used to lead a successful clinical trial at Carmell Therapeutics drew on academic research skills strengthened while earning a doctorate in mechanical engineering at Georgia Tech, and her experience in product R&D gained throughout her industry career. Though Kladakis enjoyed academic research, she felt drawn to industry for the opportunity to incorporate the latest scientific concepts into a commercial product that has the potential to improve lives. Now preparing for a U.S. and a European clinical trial of the bioactive bone putty, Kladakis is gearing up to face the regulatory hurdles that come with novel products. The bioactive bone putty is considered a biologic product since its composition includes blood products. Biologics don’t fit neatly into either of the FDA’s well-established regulatory pathways for pharmaceuticals or medical devices. As the demand for and potential benefits of biologic-based medical products increase, Kladakis is hopeful that change will come. Bringing safe and effective products to patients in a way that is more financially sustainable for companies will require collaboration between government and industry, she said. To overcome the challenges she meets every day as a manager and executive in a fast changing industry, Kladakis relies on the communication and collaboration skills she developed by studying engineering in a liberal arts environment at SEAS. But the true fun of her day-to-day work often comes down to the science itself, which is what drew her to this field to begin with.